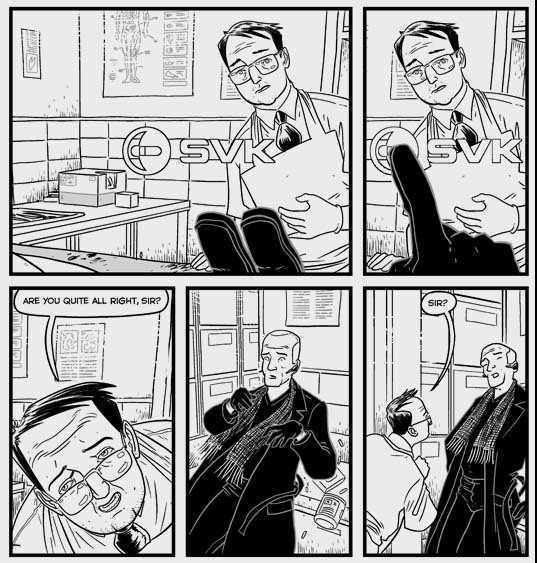 SVK by Warren Ellis and D'Israeli. "Thomas Woodwind. A man of six feet or so, quite lean, with a good Patrick Stewart-ish skull fuzzed with very short pale hair. Paranoid eyes. Tending to very long black coats, with poacher’s pockets sewn on the inside.. A bluetooth earpiece cupping each ear. Black gloves – no fingerprints, reduction of epithelials." What sets this noir-ish detective type caper (Ellis describes it as “Franz Kafka’s Bourne Identity”) apart from a normal comic is of course the invisible ink elements and the accompanying SVK torch which allows the reader to view these extra elements. The thing that makes this more than just a gimmick is the very clever way in which this feature is woven directly into the narrative, to say more is too much of a spoiler for anyone who does get their hands on one of these. The writing is typical Ellis, smart and darkly humorous, the artwork by D'Israeli is clean, crisp and simple printed in black and blue tones and also elements in the invisible ink. Set in a slightly futuristic London this experimental publication can be read on it's own and is a good read as such but when read through with the additional elements revealed by the torch (a slightly larger than credit card sized bit of kit) it takes on a whole new level. In addition to the main story there is a foreword by William Gibson and short essays by futurist Jamais Cascio and comics expert Paul Gravett, the latter of which I found very interesting. At £10 plus postage and handling it is not for those with just a passing interest but if you are a fan of Ellis' work and/or want to see something outside the usual scope of comics it is worth getting on the mailing list for the second print run (the first having sold out very quickly indeed. The cost reflects that this is not just a comic but a comic and an object published and distributed in a non-traditional manner, you won't find this in your local comic emporium any time soon.